Is Uber Trying to Kill You? 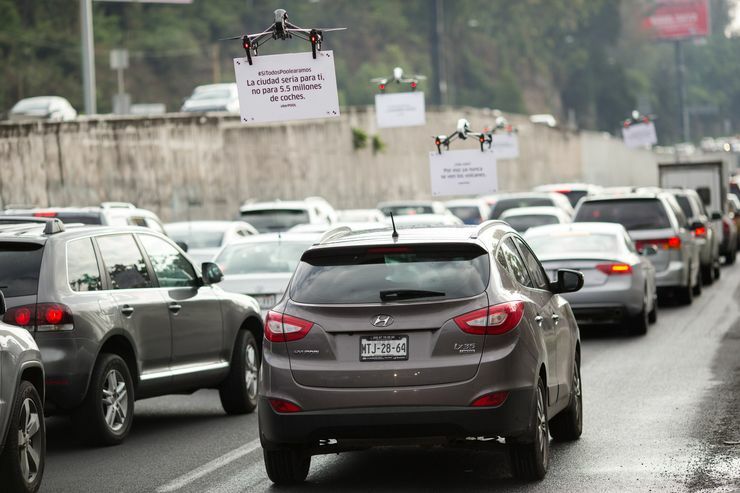 I bet it sounded like a great idea in the boardroom: Hey, let’s find a nasty traffic jam, with lots of stop-and-go traffic and fly some drones over it with advertising! Wow! Great idea! Captive audience! Stuck in their cars! And they will just look up in the air at our drones while in this stop-and-go traffic and read our advertisements about car-pooling! I once ripped on Geico and the Port Authority, for stupidly planning to put Geico ads in a crowded toll booth plaza. The signs would have touted “safety” while diverting the attention of drivers to read the signs in that crowded plaza. Genius. Human error from distracted driving is the leading form of injury from vehicle collisions. Advertising schemes that distract drivers on crowded roadways can only makes things worse. So Uber is taking things to the next level past Geico and the Port Authority, cranking stupidity up to 12, because the eventual injuries that would most certainly happen from the continuation of such a program shouldn’t be joked about by saying the stupidity merely goes to 11. The activity is taking place in Latin America, where Uber hopes to increase their market share. But can this Latin American experiment be replicated on New York’s roadways? Well, even if they could somehow get FAA approval to do it, my guess is that the company would get sued out of existence for the very predictable, and quite inevitable, injuries that such distractions would be a cause of. This wouldn’t simply be negligence, but in my view, recklessness, that would subject the company to punitive damages. And you thought that Uber drivers merely being distracted themselves by looking at their devices was bad. No, but plaintiffs’ lawyers may be. Trial lawyers have blocked Uber’s expansion into upstate New York, despite the fact that “ride sharing” has been proven to decrease incidences of drunk driving and fatal car accidents. Are New York’s plaintiffs’ attorneys so worried about losing the big business of car accidents that they will block technologies that reduce those accidents? You bet. While you are well off-topic, I will allow it and respond anyway. I know of no policy by trial lawyers to stop any taxi service by any name. I am aware, however, of deep concerns over taxis and other car services having inadequate insurance. The current minimal limits are a disgrace. Perhaps this will be a topic for another day. If they were truly aiming for our demise (one way or another) then maybe they should rename themselves “Unter”. This certainly takes the distracted driving problem to a whole new level! Yeah, by the looks of things, about 10 feet off the ground. I once had the bright idea of flying drones out over car accidents for the purpose of advertising my client PI attorneys to accident victims. Of course it was a joke and we all laughed, then stopped a for almost a full 4 or 5 seconds and thought about if it could be done …. hmmm. Haha, don’t judge me. Too late. And the judgment wasn’t kind. I agree, this is beyond stupid. I was glad to hear that this didn’t happen in the U.S. and I sure hope it never does. And I also agree, that Uber would be opening themselves up to huge lawsuits if they tried to pull this stunt here.